Yesterday I came across a printed advertisement containing a QR code. It was in a bathroom, so you can imagine what I was doing while staring at it. I was peeing. I’ve been in a similar situation before, and it let me thinking about the reasons of why QR might not be that popular. I think that one reason is a translation issue. I mean changing from an abstract visual data/information to some data/information that a person can understand. 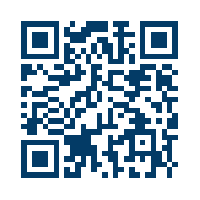 When we observe QR codes, they basically mean or denote nothing. In that regard, why should a user need to carry out a set of steps to translate, discover what the QR code says? In that bathroom situation, why should I have to take my phone out, look for the appropriate app and scan the code? I can easily google the name of the restaurant by using the same device at that moment. It’d be faster! Those steps for translating the visual abstract data/information from the QR code into a form that a human can understand seem to be unnecessary. Nonetheless, I do think that QR codes provide an interesting opportunity to design for user experience. Imagine this, as some cameras can detect faces and smiles, it’d be great that our smartphones can detect the QR code and do something with it. Automatize something. For instance, imagine that once you scan the QR code, your phone downloads an app and feeds it with your personal data stored in the phone. Consequently, a restaurant knows “your taste” and offers you a bottle of wine, free desert, or takes into account to guide you in your search for similar restaurants elsewhere. 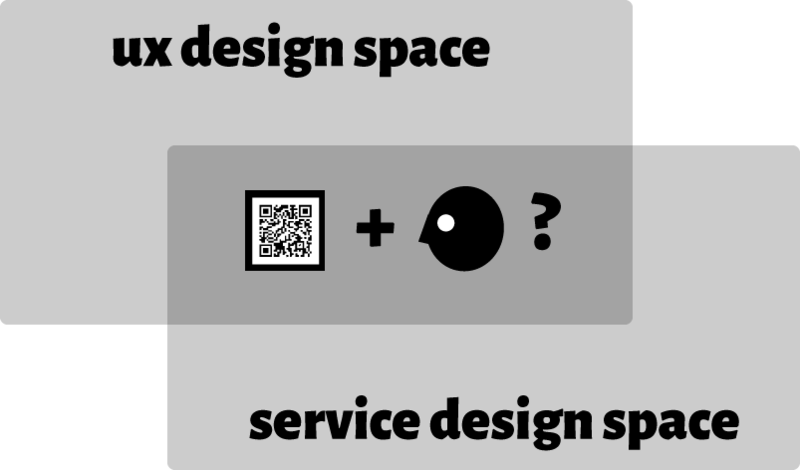 What experience can we design for QR codes? We have the QR codes. They’re design is there. It’s restrictive. However, I little bit of imagination could bring us to exploit the use of QR codes better. They were invented for some reason. And people are still using them for some reason. An interesting UX design space seems to be there to explore and re-think the purpose and UX with QR codes, including how to make that translation issue seamless or better, get rid of it. I don’t know why I hadn’t paid attention to it before. Maybe it’s consequence of being surrounded by design philosophers, feminists, and rhetoricians as part of my PhD education. I’m talking about the postcolonial role of design in the development of the Mexican culture. I don’t have a concrete argument here, but sparse thoughts and questions. All of them are consequence, in turn, of being exposed to the architecture of some european cities I’ve had the opportunity to visit. 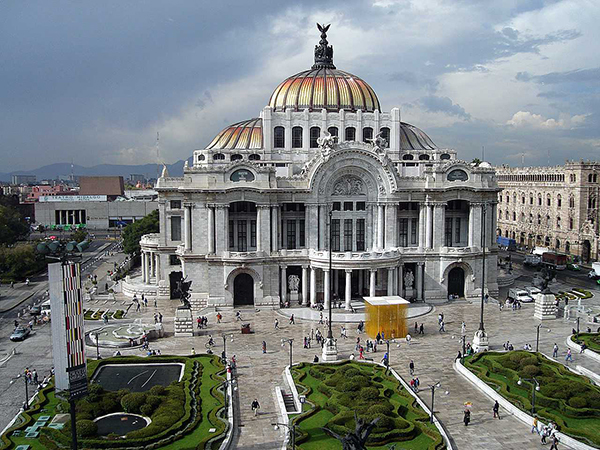 By observing and reflecting about the architecture of Europe and Mexico, I couldn’t avoid thinking about how the hegemonic vision is imposed through design. 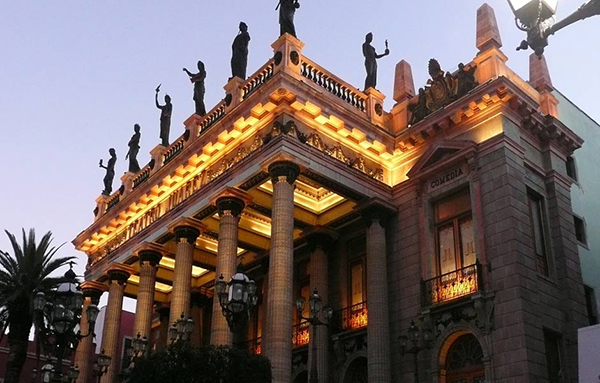 The (Mexican) architecture, as I imagine that it occurs all over Latin America and other colonized countries, shows such hegemonic vision. It seems that design, before and nowadays, either we talk about architecture or object design, is clearly the materialization of the hegemony. Design works as a cultural wax stamp. I just heard in the DRS 2014 Conference that, as designers, we should pay attention to the design needs of Africa and Asia due to their coming population growth, including its economic impact. Who should be in charge of these design situations? To what extent design should avoid fostering a neocolonialist vision? Is there a design vision and education emerging from not-western countries that should be taken into account? In other words, do we need to use that cultural wax stamp as safe action? How much? 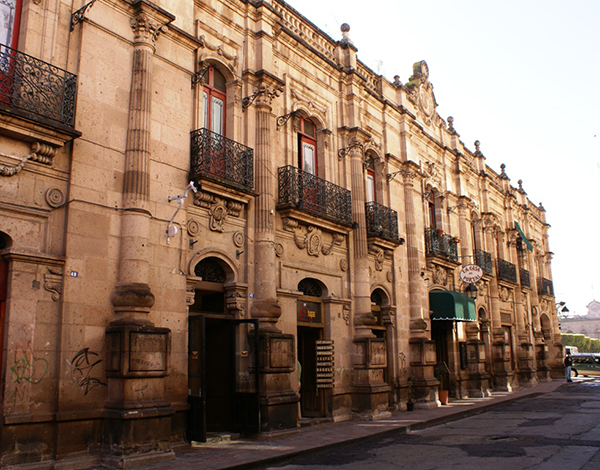 The old zones of Mexican cities show the European heritage in terms of functionality and aesthetics. 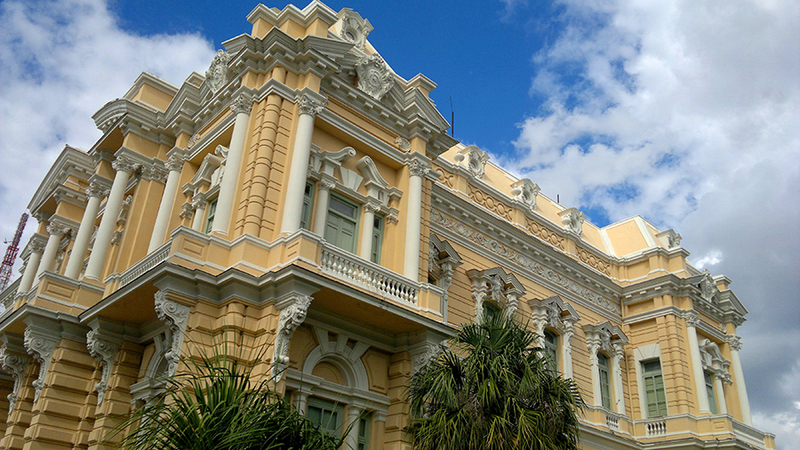 Furthermore, current developments also follow modern architectural approaches influenced by developed countries. 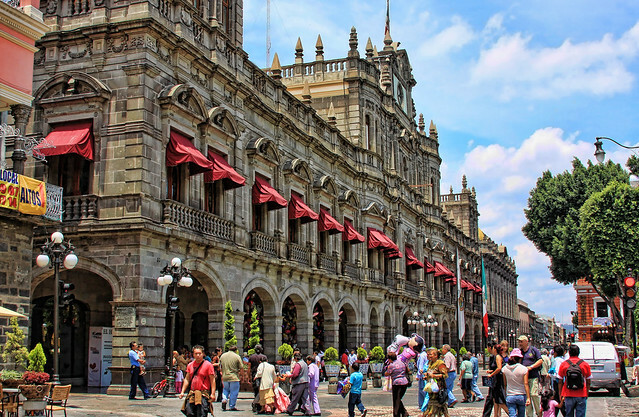 Nevertheless, Mexican cities don’t identify themselves as European cities. The Mexican flavor has developed on its own. So, why do Mexicans need to care about how the european vision has affected what they call culture? Will it make any change? Is it anyhow relevant to make a comparison with the inherited wester design and the design that mexicans are allowing to conquer them nowadays? I know that it might sound as an exaggeration. Too much buzz around the idea of architecture, and hence of design. Nevertheless, just by observing, reflecting, and understanding architecture as an evidence of a repeating history, it comes to my mind more doubts about the failure of design. It comes to my mind images of clumsy Mexican cities where the marginalized zones are not considered as design projects; software that is not inclusive for the heterogenous societies within the Mexican Republic; or even an image of how certain products and services might be unaccessible for people whose user or consumer profile parallels to that of people in USA or Europe. I think that Design perceived as a transformative action deserves a couple of thoughts. It changes reality, and hence, it changes us. Therefore, shouldn’t we be more critical about how other forces affect our agency? Regardless, I’d bet that any thought about Design and its implications is just as mess; as anything that plays part of transforming the world. 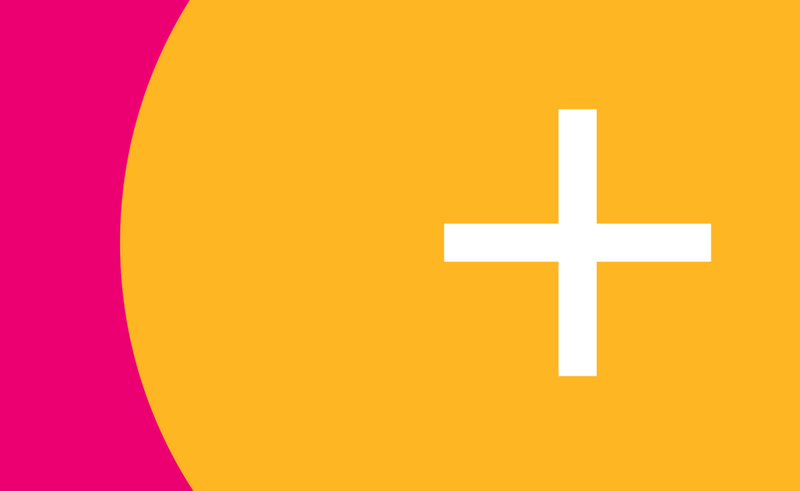 In a previous post I commented about some examples of flat design for user interfaces (UI) and about the prominent use of the circle—as the basic widget component in such design. Later, I found this novel user interface design for car controls proposed by Matthaeus Krenn. From my perspective, this is a great example of how Information Design and HCI/UX Design overlap. 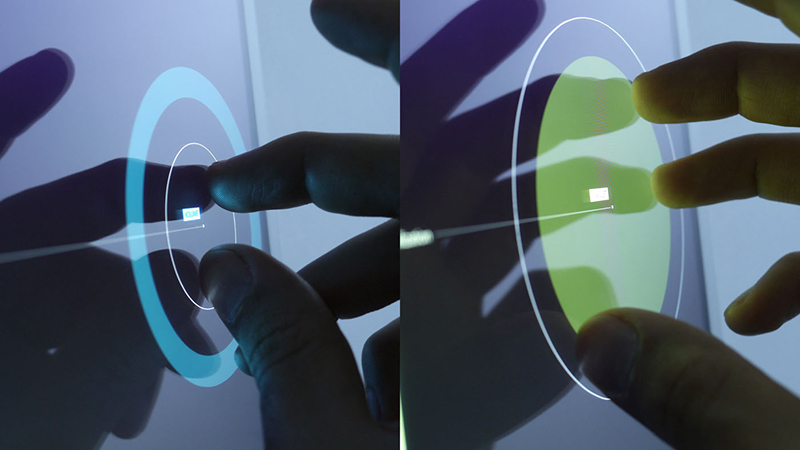 In his proposal, Krenn attempts to integrate a gesture-based interaction with a low cognitive load interface. As we observed from the video and images below, he seeked to visually synthesize the information and make the information as least intrusive as possible—for the driving experience. 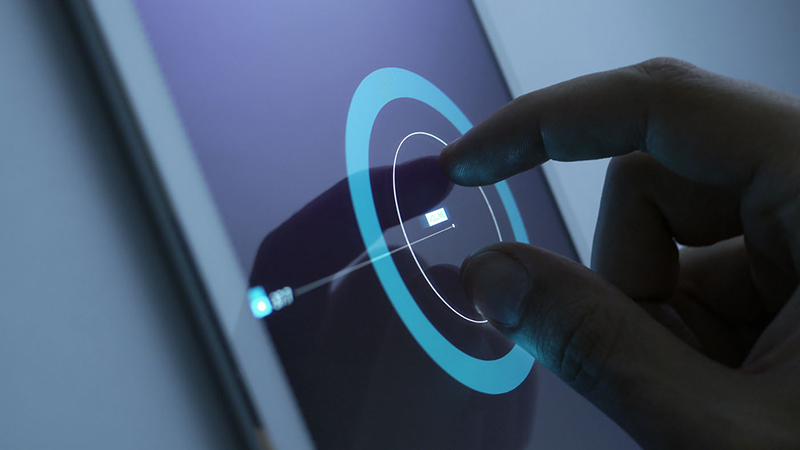 The circle seems to be the best shape to represent a manipulable object—within a flat screen—when considering a gesture-based interaction. As I mentioned before, I conjecture that our experiences, in relation to manipulating spheroids since we’re born, influence this type of design rationale. That is, to make the connection of the fingers—something physical and tridimensional—with something abstract and flat, we still need to refer to something in the real world. That is, the metaphorical reference. Size (diameter). This is clearly a variable that represents quantity, which goes from zero—the absence of the widget—to the maximum—as wide as we can extend our fingers on the screen. Tilt. As I observe, the key aspect regarding this variable is having a reference point. 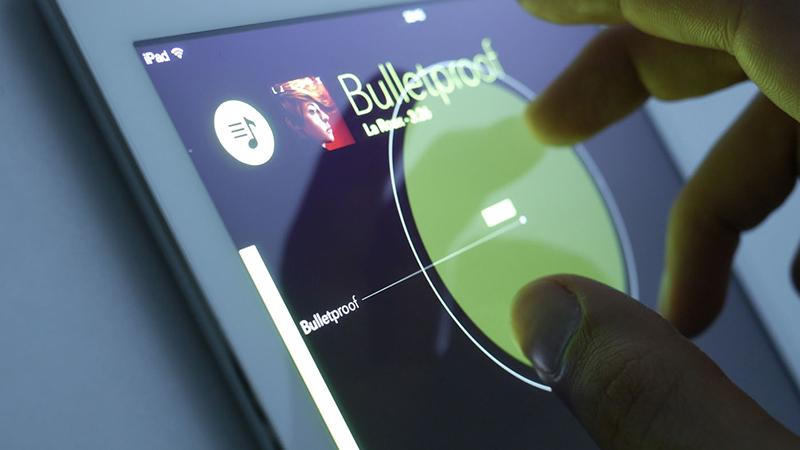 When the user decides to tilt the widget, a cognitive model of range is created in the user’s mind at that moment. Yet we may reflect whether the latter adds complexity to the interaction. In this regard, I assume that tilt as an interactive variable is suitable for qualitative range, or ranges that are not require to be that precise. We don’t need that tilting represents a hard/long decision to the user, specially in context of use where the user is saturated by diverse information sources—as it may occur for the case of car controls. X-value. This variable—that represents values along the horizontal axis—in conjunction with the y-value—vertical axis— determine the center of the circle and hence the current position (x,y) of the widget. What Krenn shows to us is the convenience of decomposing the center into two independent variables. He employs only one axis, but the idea of observing the scale at the side of the screen provides a mental reference for using either on axis or two of them. From Krenn’s video, we can note that setting the origin point (0,0) is critical in terms of both interface and interaction. 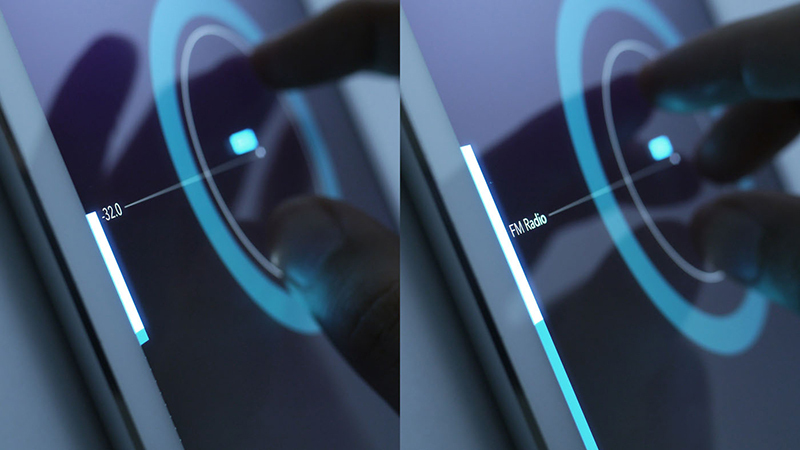 Krenn’s proposes a good approach by setting this point relative to wherever the user touches the screen at any moment. Y-value. As it occurs with the x-value, the vertical axis can be used to represent another quantity. In this way the user can set the value of two variables at the same time. Nevertheless, as I’ve experienced with Photoshop for iOS, it’s frustrating to deal with different quantities due to the sensitivity of the screen (or lack thereof) and a finger. As Krenn comments in his video, the design should take in account this issue and validate the interactions. One idea that came to my mind is snapping to values that makes sense. In Krenn’s proposal, the employment of the vertical axis only, in addition to rationale behind the increments/decrements according to the function/velocity of fingers, contribute to validate the interactions in this UI. I get excited by observing design proposals as the one from Krenn. As I stated before, I think that Information Design plays a key role in the shift of any interactive paradigm. As designers, we should be conscious that we not only interact with products/design since the moment we wake up, but also we consume/interact information by means of our senses. Because of the latter, I remark that is difficult to see the actual boundaries between information and interface. Hence, representing information in a usable fashion and make it part of an interactive aesthetic experience is something really hard. Yet it represents to me a critical aspect that HCI/UX designers should pay more attention and recognize the implications of a matter where form & function cannot be practically detached. How would you visually/sensorially redesign all the information you’ve consumed/interact with since you woke up this morning? Design, Science, Art and Craft: among facts and abstractions. What’s the difference between Science and Design? What about Art and Craft? Is design about something concrete (an object), a process, an line of thought? Further, by taking User Experience (UX) and Human-Computer Interaction (HCI) as knowledge disciplines, what’s the relation of UX with Science? 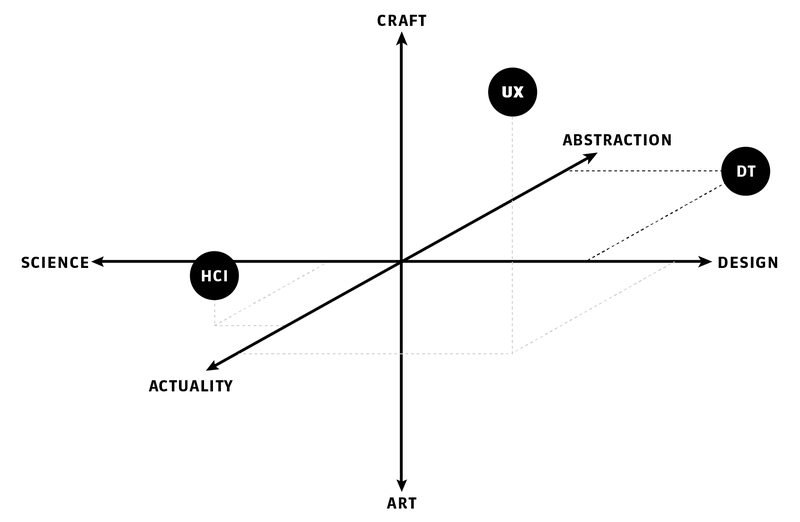 Does UX belong to Craft or Art? What can we tell about HCI? These are very difficult questions to answer, and they require to take a philosophical stance—at least, I assume—in order to create arguments and hence generate discussion. So, what’s the point of this post any way? Although I think I don’t have the answers to all these questions whatsoever, I would like to share my perspective on how these big words relate each other by means of the following schema. Relational space between Science, Design, Craft, Art, Actuality and Abstraction. El diseño implica arte pero el arte no implica necesariamente diseño. La ciencia implica diseño pero diseñar no implica necesariamente hacer ciencia. Aun así, la ciencia implica hacer arte. Design implies Art, but Art not necessarily implies Design. Science implies Design, but to design not necessarily implies doing Science. Yet Science implies doing Art. My point here is that “doing Science” in real life is not that rigid as it looks in paper. To me, it involves both aspects of Craft and Design. Further, this phrase indicates the underlying implications of using a particular language at the moment of reflecting and philosophizing. 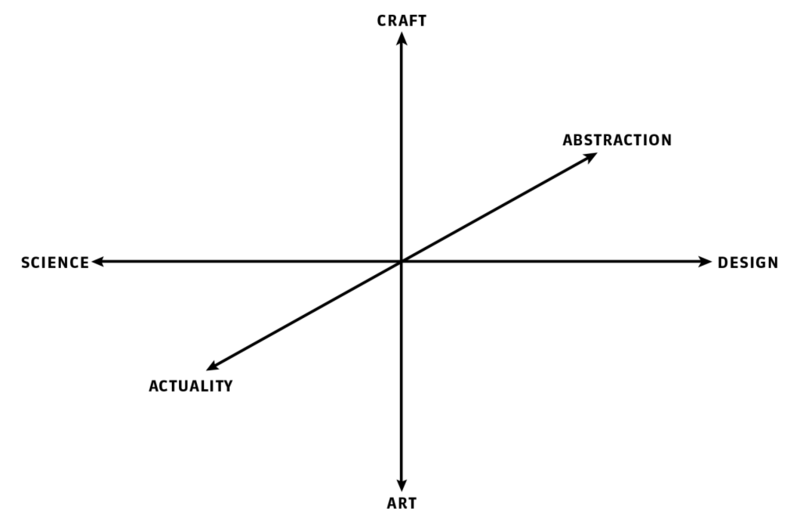 Regardless, the selection of this continuum is somehow influenced by the perspective of Howard Risatti when comparing Art and Craft—although I don’t share his vision regarding Craft and Design in this “Theory of Craft”. For the case of Science and Design, I consider the relation between these two as discussed by Nigel Cross and Harold Nelson & Erik Stolterman. As I tried to embed it in my phrase above, I state that it turns out difficult to outline strict boundaries in the relation of Science and Design. All depends on what type of definition, questions, and the place where those questions are made. The third continuum entails the consequences of Art/Craft and Science/Design in relation to the real world. Thus, I consider—at least—the range that goes from abstraction to actuality. That is, from ideas to things that people can interact with. This continuum is theoretically related with ideas such as the “ultimate particular” and “design inquiry“—as a compound of the inquiries into the real, ideal, and true respectively—by Nelson & Stolterman. The relational schema presented above doesn’t have the intention of being prescriptive. It corresponds to my personal viewpoint and a attempt to formulate my position as HCI/UX researcher regarding the type of research/discourse generated in my near context. That is, among the faculty and colleagues at Indiana University Bloomington. Further, since I have interest in schemas/diagrams/sketches, I generated it as an example of how schemas may function as a means for argumentation. My purpose here is for you to take this schema and tear it up. Make it your own. However, before you go and destroy this relational schema, let me show how it helped me to sketch the answer to the aforementioned issues. As we observe from the schema above, the relational space is conformed by three axis, each of them representing one of the continuums describe above. Then, I perceive User Experience (UX) as a discipline highly design-oriented, focused on concrete outcomes, and with a high flavor of craft in its practice. I think these qualities make it different from other approaches regarding interactive artifacts-systems such as Software Engineering, ICT, or Computer Science. 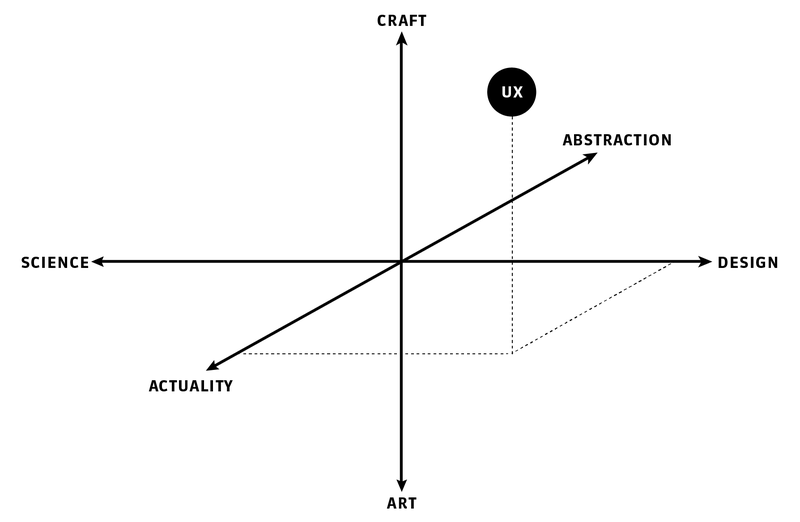 UX in relation to Art, Craft, Science, Design, the abstract and the concrete. 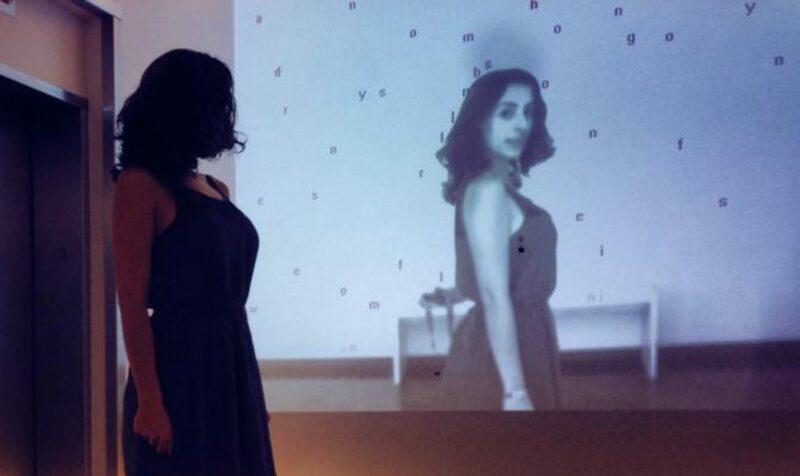 On the other hand, I locate Human-Computer Interaction (HCI) in a different place within the relational space. I perceive HCI as more scientific discipline focused on concrete outcomes, yet with certain nuances of craft in its practice. I remark that I’m talking about a general or traditional perspective of HCI. In other words, a practice—and also its research—more emphasized on the first and second waves of HCI. HCI in relations to Art, Craft, Science, Design, the abstract and the concrete. 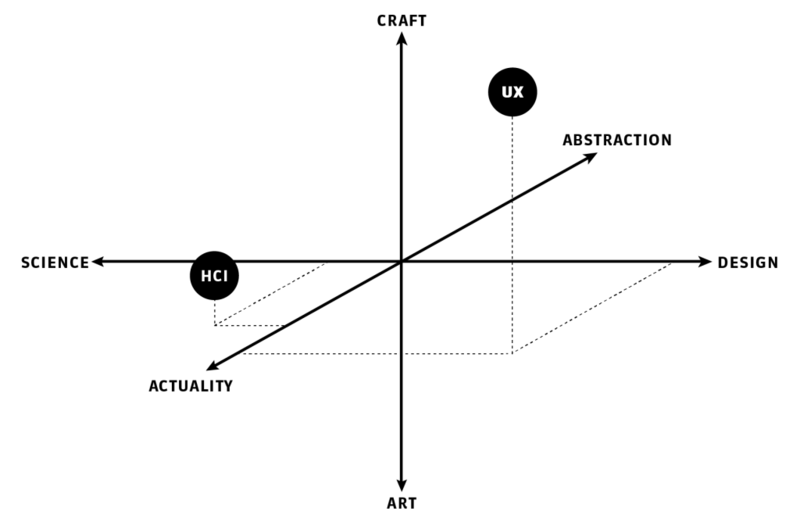 I consider that HCI influences UX, more than the other way around. Although HCI provides foundations and methods to UX, the latter seems to lack of impact regarding HCI in this fashion. Of course, this discussion could be very extensive and profound. 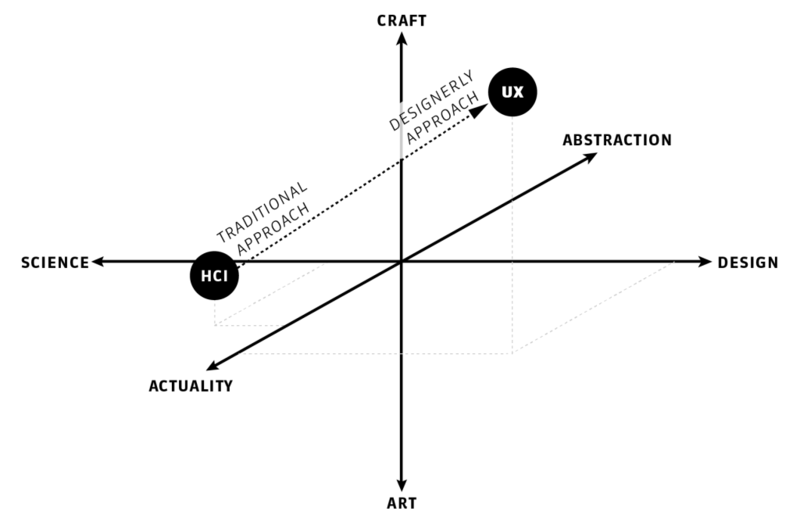 So far, I remark this influence with an arrow, just to indicate that HCI may entail a more traditional approach whereas UX corresponds to the designerly approach. Designerly and non-designerly approach to HCI/UX. In the attempt of describing the relation of HCI and UX and the implications that each has on the other, I’ve observed that within the HCI track—in the School of Informatics and Computing at Indiana University Bloomington—theory plays a critical role. It provides the discursive components to understand the aforementioned relation. Thus, in this milieu I’ve heard of design theoretical topics such as Slow Change Interaction Design, Sustainable Interaction Design, Feminist HCI, HCI Criticism, Participatory Design, Critical HCI, Design Theory, and Design Pedagogy, Practice and Methods. All of them gathered under the big umbrella of Design Theory (DT). 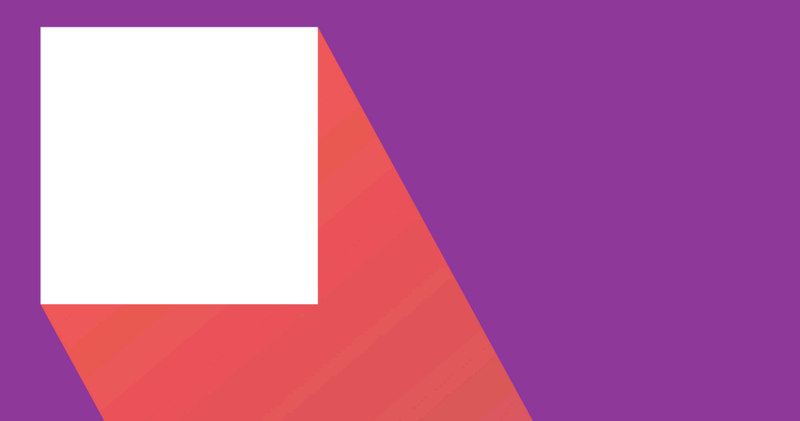 Design Theory in relation to Art, Craft, Science, Design, the abstract and the concrete. From my current perspective, UX influences DT since it provides the input to start theorizing about design. The consequences of UX are actual design cases. At the moment (design) researchers start analyzing those cases, a universe of study is created. By picking one planet, system, or galaxy of such universe, the (design) researchers cannot avoid to meet a philosophical situation since there’s an intrinsic relation between the researcher and the piece selected to study. And just as we may observe from the last sentences, the attempt to understand becomes a matter of (design) philosophy. The relation between UX and Design Theory. So far, we’ve observed from above the relations of HCI→UX and UX→DT. The question is now, in terms of DT and HCI, what is the discipline more prominent to influence or affect the other? I want to remark that it’s not my intention to be prescriptive. Based on my experience, I think that DT→HCI marks the relation within the type of research I’m currently involved. That is, DT provides HCI with theoretical foundations, which are in turn employed to generate frameworks. Not necessarily connected with the latter, (design) methods are located very close to HCI in the path of this connection. Nowadays, more that thinking about their degree of applicability, I think that the so-called design methods could work without a deep—and hence philosophical—understanding of DT. I conjectured the latter based on my early experience with HCI, particularly as an undergraduate and latter getting involved with HCI researchers. The relation between HCI and Design Theory/Theories. As I mentioned above the relational schema has the purpose of helping myself what’s my position as HCI/UX researcher. The relational schema is limited in order to respond to such statement. However, it provides a means to make an approximation for such goal. I notice that more than talking about a precise position as (a possible future) researcher within the relational space, I can better reflect on the interrelation of UX-HCI-DT to understand on what research field I can work at. For instance, in the schema below, I picture a research field with big emphasis on the actuality and Art dimensions—although the connection with DT will always be there. 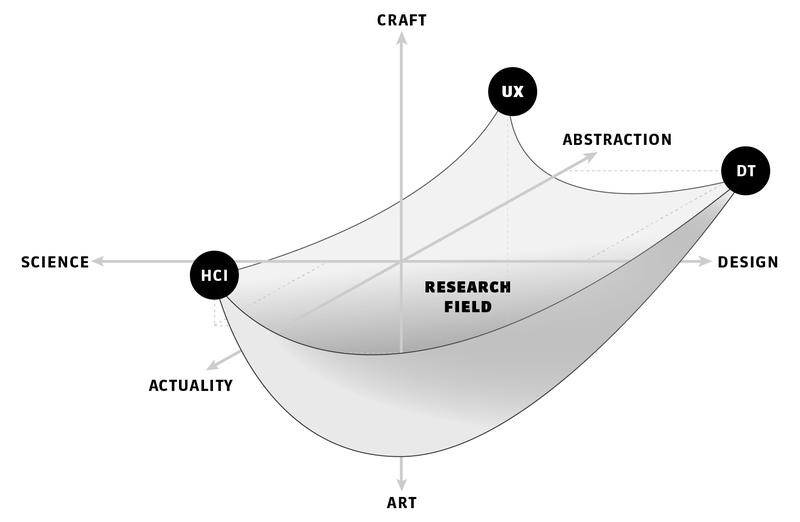 Any change on this membrane represents a different framing on what to pay attention as HCI/UX researcher. 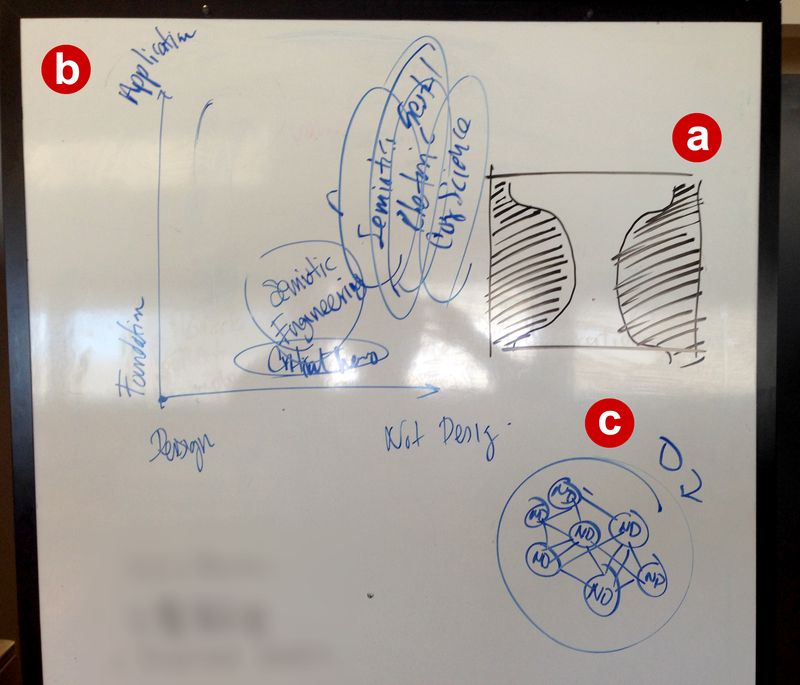 Research on design as reconciliation of HCI, UX, and Design Theory. There are as many membrane variations as HCI/UX researchers. In my case, I know that my academic/professional past as designer and my current formation as scholar influence on how I frame the research field I’d like to work when I reach the dissertation stage. In this sense, I remark that relevance of the context. My advisor Marty Siegel, my mentor Erik Stolterman, the faculty, my colleagues PhD students from all the tracks, and the master’s students from the HCI/d program have a huge impact on shaping my particular membrane. Drawing is a skill associated with design, and other creative disciplines. I consider this should not be the exception for Human-Computer Interaction (HCI) Design. 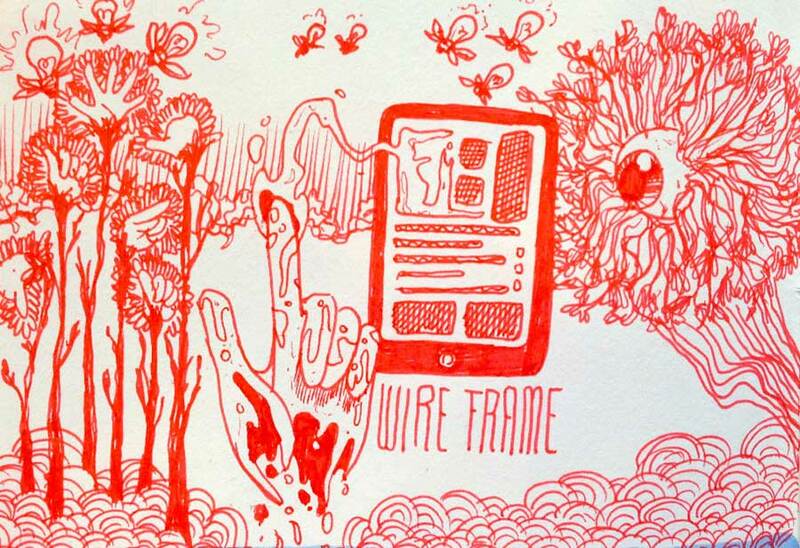 Drawing is a way for synthesizing and engaging into reflection. Crucial skills for an Interaction Designer or User Experience Designer. The basis of a systems-oriented thinking is analysis. 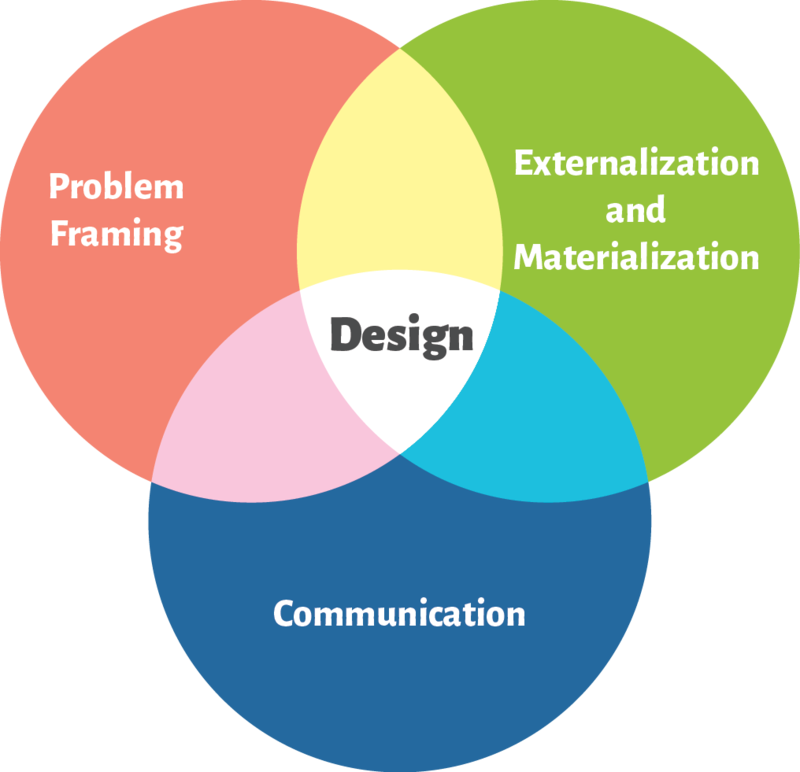 Although when a strong skill for analysis is needed for designing technology-driven solutions, amalgamating all the information [chunks] in order to create a new and feasible design is complex task. Hence, synthesis plays a crucial role in HCI Design. However, not everything is about synthesizing. Abductive reasoning is in essential design thinking. In fact, the three of them –analysis, synthesis, and abduction– practically occur in a non-linear almos-simultaneous fashion during the design process. From my experience as a designer and teacher, drawing is a powerful tool for supporting memory and reflection. Talking about the relation of drawing and memory is quite straightforward. Drawing allow us to materialize our thoughts and archive them for future references and inspection. That’s why I’ve decided to focus on drawing again. I realize my memory is kind of bad, and this flaw needs to be beaten by the use of some artifact that connects me back with previous thoughts. I found drawing as a pleasant way for creating this artifact. Of course, I don’t deny the power of writing whatsoever. That’s the reason of this blog’s existence in first place. That implies another post, though. 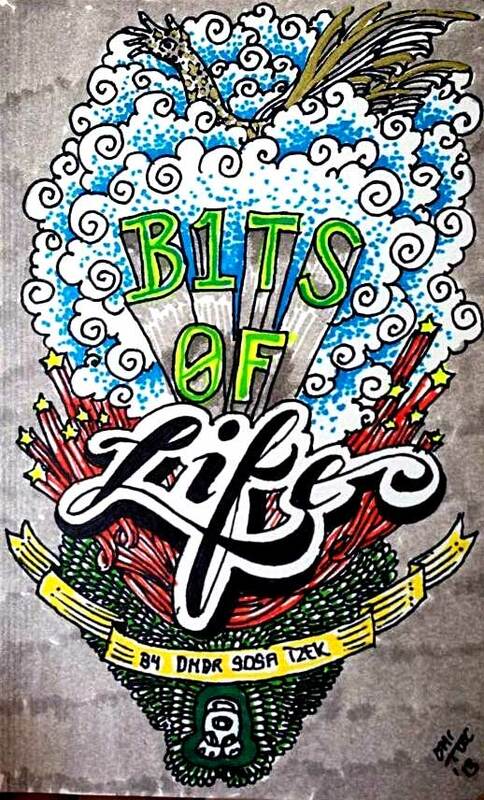 Cover of my personal journal of micro-drawings and written notes for not forgetting things from my experiences I want to reflect upon in the future. Drawing is also a tool for reflection. Particularly in Schön’s terms –Reflection-in-action and Reflection-on-action. From my perspective, drawing is one way of pushing through all the complexity –expression said by my advisor, Marty Siegel. While drawing, analysis, synthesis, and abduction happen. It is inevitable to reflect in the actual drawing decisions –Reflection-in-action. However, from my perspective, the magic occurs when reflecting upon past experiences, concepts, ideas, or even knowledge during the act of drawing. In this sense, composing becomes more complex than determining which components to draw, their representation, their position, and their relevance. Synthesis and abduction combine during the overall process. They contribute on the creation of meaning around a drawing. Now that I’m conducting research on Interaction Design practice, and being involved with a HCI Design graduate program, I’ve decided to keep drawing. Of course, it’s also a hobby I really enjoy. Though, it’s a mental and physical activity that connects and disconnects myself from the realm of Design and Human-Computer Interaction. Keep calm and carry on drawing.